well, we’ve only been going since 1993! Based in Mansfield, Merlin Glass Fibre Roofing are a highly experienced and professional company providing futuristic roofing and flooring solutions. Fibreglass is a very adaptable material that can be applied almost anywhere to improve water resistance, strength and durability. It is suitable for both modern and older buildings and will sympathetically blend in to the surrounding structure whilst extending its life. 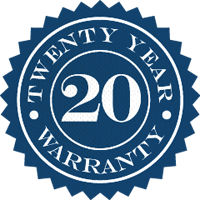 Our fibreglass flat roofs come with a 20 year guarantee as standard, but the life expectancy of our installations far exceeds that. Certainly we have never had to replace or repair any of the flat roofs we have fitted. This is why fibreglass is such a great material for roofing, it’s resistance to water penetration, cold and heat give it a durability far superior to other roofing materials such as rubber and felt. We have installed a wide variety of fibreglass products, from shower trays to flat roofs on garages and larger buildings, to stairs, wetrooms and kitchens. We specialise in repairing and replacing the roofs of older buildings, and we are professional Portico roof installers. Fibreglass is so adaptable that we haven’t got the space to list its many applications, so if you can’t see what you require on this website please call Ian on 0800 3118262 who will be more than happy to offer advice and assistance on your fibreglass roofing and flooring needs. New roof. Ian's work was to the highest standard, he was very friendly and kept me posted all the way through the process, I would recommend Ian to anyone. The stronger, longer lasting and better looking solution for any replacement roofing or flooring.